I couldn’t find a pic of Joren running indoors, but these two ladies are nicer to look at anyway. 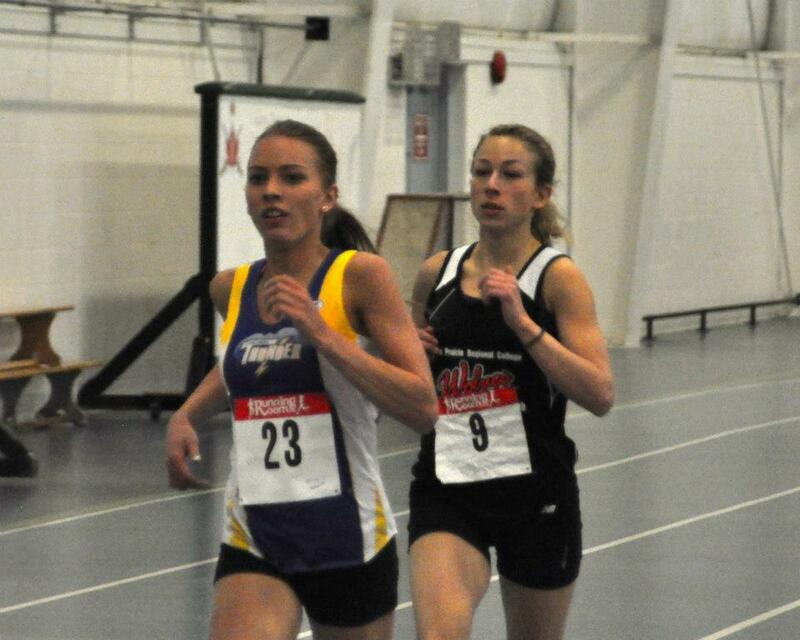 In the Senior Women’s category, Jamie Wigmore was also a double medalists at Indoor Provincials, capturing bronze in the 1500m and silver in the 800m. Bronze medal 4 x 400m – new GPRC school record!!! 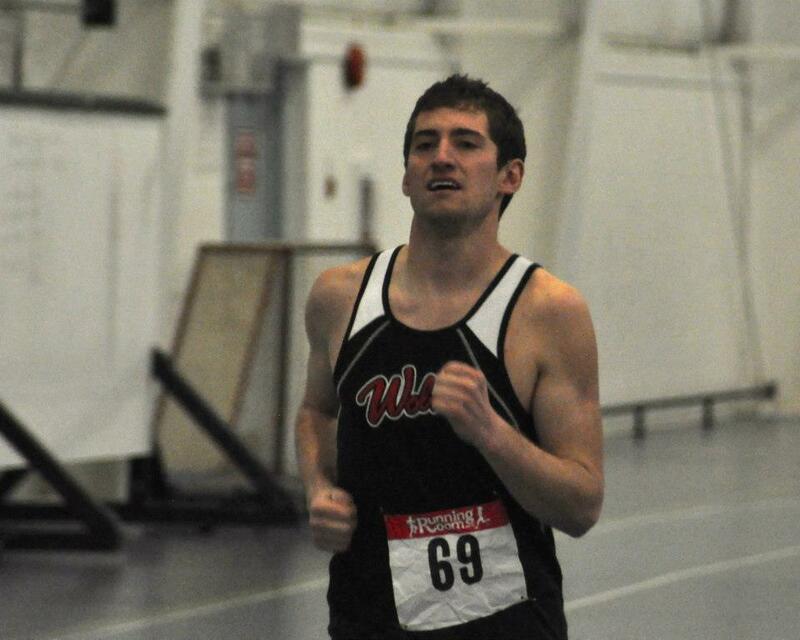 Jamie Wigmore led the Wolves with three individual medals: 800m (Gold), 400m (Silver), and 1500m (Bronze) at the ACAC Indoors. She also anchored the women’s 4 x 400m team to a bronze medal. Collectively, the Wolves women placed second behind MacEwan in the team competition. The group was also inspired by Emily Whalen’s destruction of the magic 3 minute barrier in the 800m for her first time. Sanchez’s pic will come later. Instead, here’s a sweet pic of Wolves Legend Cody Krantz – a true beauty, that kid. Hayden “Sanchez” Hollowell established a huge personal best in the Times Colonist 10 km. The 19 year old pride of Hythe, AB clocked 33:34 to finish 18th overall (in a field of 9487 finishers). He won the U19 age category. Eric Martinek also distinguished himself with a 31st place clocking of 34:47. And fueled primarily by Smirnoff Ice, Cody Krantz stormed by some old guy in the last 100m to best the 45 minute barrier. In 2013, Hayden Hollowell and Jamie Wigmore excelled on the track and over x-country courses, but May 26 was their day to shine on the roads as they captured the men’s and women’s titles respectively at the Daily Herald Tribune Press Run 10 km. Hollowell clocked 35:17 while Wigmore recorded a time of 42:12. The ASAA NW Zone Track and Field Championship marked the debut of a new dominant runner on the Alberta high school scene, Mirelle Martens. In her first- ever track race, the 17 year old St Joe’s student smashed Jenna Huber’s 11 year old Zone record in the 1500m, recording a time of 5:00.0 . 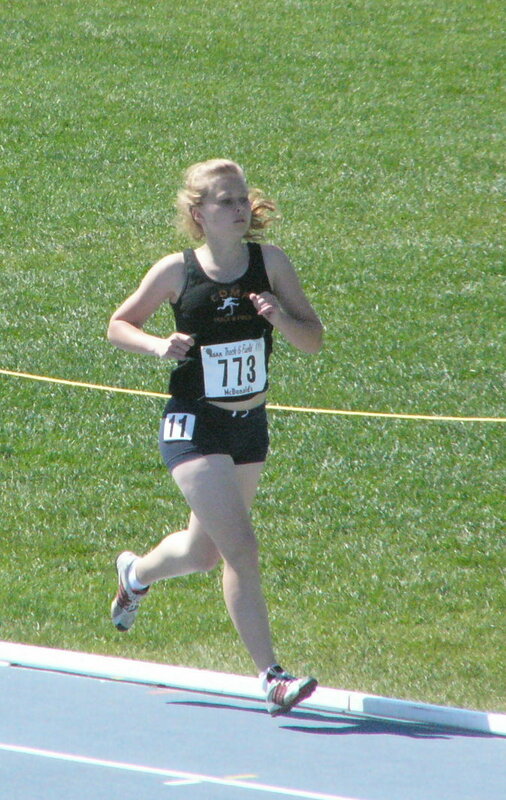 Martens also won the Senior Women’s 800m and 3000m at the meet. Teammates Danae Keddie and Brittany Duval also set new NW Zone records: Keddie in the Senior Girls 1500m and Duvall in the Senior Girls 3000m. Also, Dylan Zambonelli (note correct spelling for a change!!) 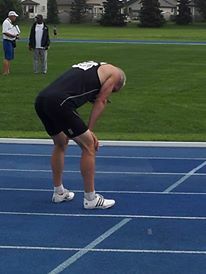 had a pair of wins: the Senior Mens 400m and 800m. 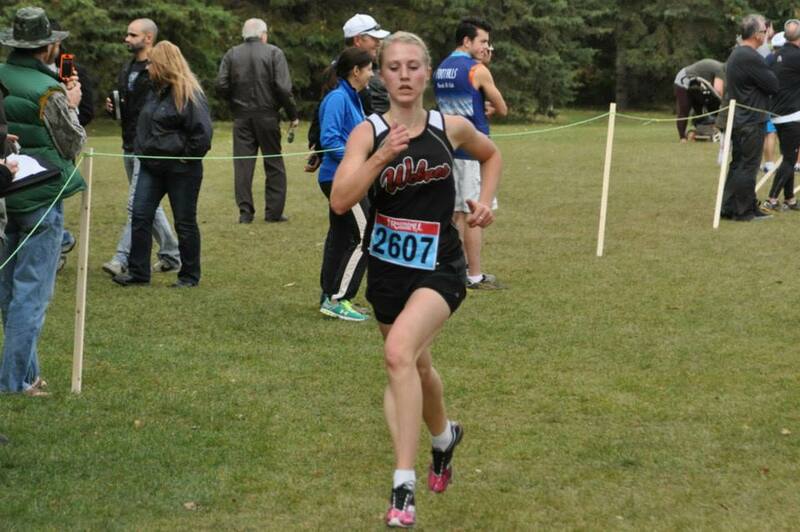 It was gold and silver for Mirelle Martens at the ASAA High School Provincials in Calgary in early June. She clocked a time of 10:34 in winning the 3000m and 4:49 for second in the 1500m. Martens also added a 6th place finish in the 800m. Not too bad, considering this was the kid’s first attempt at a real water jump. We were all quite impressed! Hayden “Sanchez” Hollowell didn’t let the absence of any steeplechase barriers in the Grande Prairie area spoil his debut in the event in mid June. 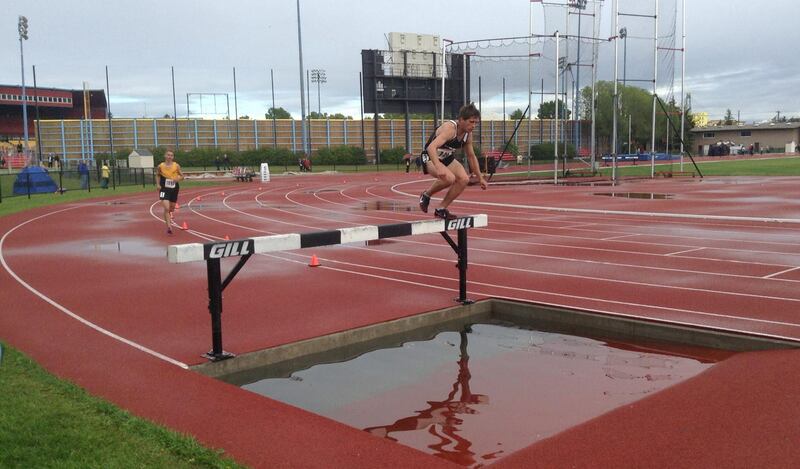 Proving yet again that “practice is highly over-rated”, the Hythe-based athlete finished 2nd in the 3000m steeplechase at the Canada Summer Games Trials in Calgary. His time of 10:18 ended the year as #2 on the Alberta Junior Men’s list. WAC 800m runners featured prominently at the AA Outdoor Provincials in mid July in Sherwood Park. Achieving podium performances in the 2 lapper were Bill Corcoran (Gold-Masters Men), Joren Manz (Silver – Junior Men), and Jamie Wigmore (Bronze – Senior Women). In addition, Hayden Hollowell and Dylan Zambonalli (name mis-spelled on purpose this time) had 4th and 10th place finishes respectively in the Junior Men’s 800m. Other notable performances on that weekend included Manz’s silver medal in the Junior Men’s 400m and Hollowell’s 4th place finish in the Junior Men’s 1500m. The appropriate image in this case would be Vaughn and/or Kayla running in a road race. But that’s not happening. Instead, we present A Pats running in her socks – isn’t that just adorable? Brittany and Dandy really upped their game in 2013. Look at those Bill Waves – world class form, ladies. Oh ya, they also ran fast at Provs too. 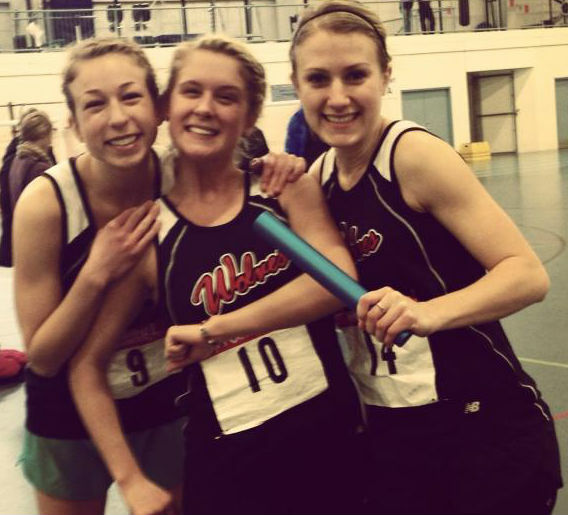 WAC’s high school trio of Danae Keddie, Brittany Duvall, and Mirelle Martens distinguished themselves in Drayton Valley at the AB High School Championships. 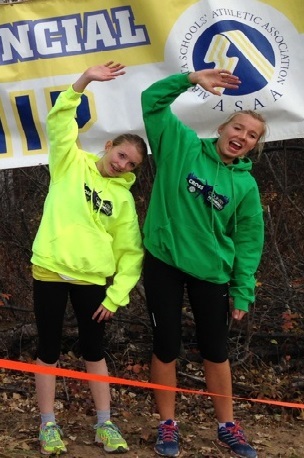 Keddie and Duvall had two of the best Peace Country High School Provs finishes in the past ten years, finishing 7th and 11th respectively in the Junior Girls race. Kirstin Manz really struggled last year, but in 2013 she stormed back, improving her 5 km by nearly 10 minutes, making the Wolves top 6 and qualifying to run at Nationals. 10 minutes over 5 km??? Who does that??? ? 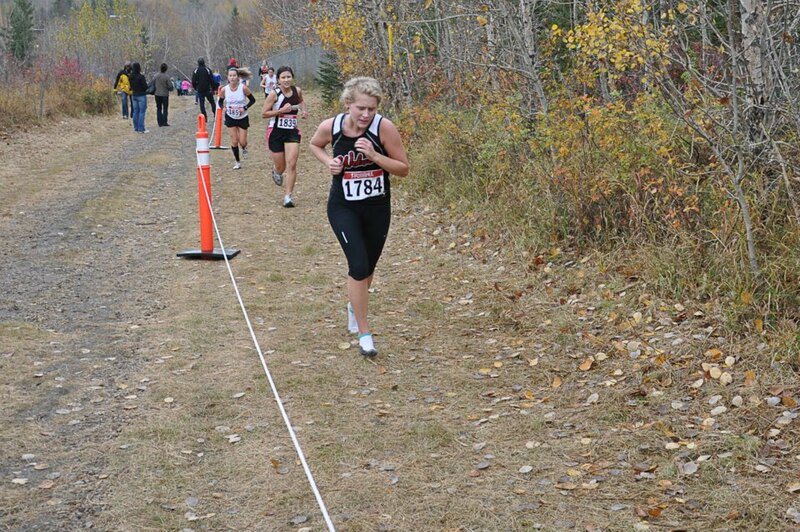 With silver and bronze medals and three All Conference selections, the Wolves Cross Country team had its best result in years at the ACAC Cross Country Running Championships in Edmonton. Jamie Wigmore, led the way, with a second place individual finish in the women’s 5 km. Collectively, the women’s team ended up with the bronze medal, their second consecutive podium finish at ACAC’s. The Wolves men placed 4th. Wiggie gave it a rip and led for awhile, but alas, 2013 was not to be her year for a national podium. Just wait until 2014, though! 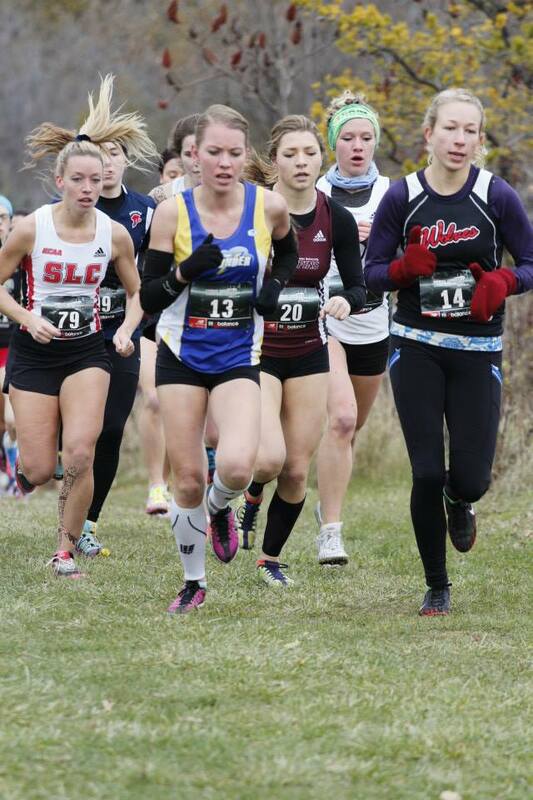 The GPRC Wolves women took on the best college runners in the country in November in Toronto and came away with a top 6 team placing, defeating the 2013 Quebec champions in the process. Jamie Wigmore had the top local individual placing, finishing 5th. The Wolves men’s team placed 13th. Hayden Hollowell, improved 15 spots from his 2012 individual result, placing 18th overall. Unfortunately, the event was marred by the tragic loss of Amanda Patteson’s I-phone …. we all miss that little guy. 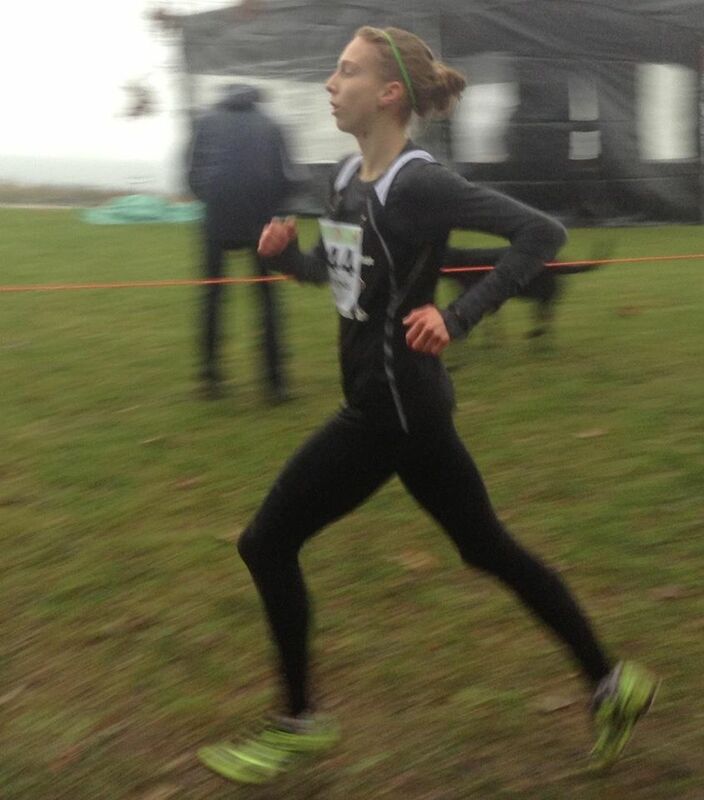 Only seven months after taking up competitive running, Mirelle was in Vancouver helping Team AB place second at the Junior National Cross Country Running Championships. That’s some pretty fine progress, I’d say! Six Wolves runners contested the Athletics Canada National Cross Country Running Championships in Vancouver and two helped Team AB to top placings. Mirelle Martens, had the best local finish, placing 33rd in the Junior women’s 5 km race. Martens was part of the silver medal winning Team AB. In his third trip to Nationals, Hayden Hollowell, had his best-ever placing, a 62nd place finish. Hollowell’s Team AB finished 4th in the team competition. This entry was posted in Uncategorized and tagged ACAC, Alberta, Athletics Alberta, Athletics Canada, Boston Marathon, CCAA, Cross Country Running, GPRC Wolves, GPRC Wolves X-C Running, Grande Prairie, Grande Prairie Alberta, Jamie Wigmore, Running, Times Colonist, Track and Field, Wolves Athletics Club, Wolves Cross Country Running, X-C running. Bookmark the permalink.